Marcel Duchamp rejected retinal art – art intended only to please the eye- in favor of art intended to serve the mind. 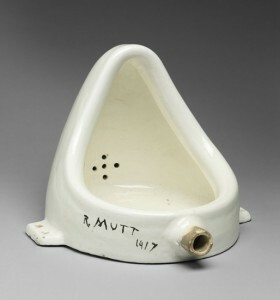 He created the “Fountain” a urinal displayed on its side, so removing it from its useful function, and signed it R. Mutt – a play on the name of the J.L Mott showroom in New York where he found the piece. The Trenton manufacturer, J.L. Mott Iron Works, manufactured iron pieces – from the utilitarian – stoves and ranges and hot-air furnaces – to the decorative – candelabra, statuary and garden seats. They also manufactured bathroom fixtures including porcelain covered cast iron bathtubs, but the urinal itself was made by a different Trenton company – Trenton Potteries Company – TEPECO. Duchamp entered his piece, which he called a Readymade, into the Society of Independent Artists exhibit at The Grand Central Palace in New York – a non juried show that was supposed to accept every piece entered. On April 9, 1917 the Society rejected Marcel Duchamp’s “Fountain,” saying it was not art, causing a scandal, and engendering much debate in the art world. Duchamp’s piece continues to cause debate 100 years later. The original “Fountain,” a piece from the Trenton Potteries Co. Bedfordshire line, was lost or destroyed, but later achieved reknown from Stiegltz’s photographs and some 15 replicas that were made. The work is regarded by art historians and theorists of the avant-garde, as a major landmark in 20th-century art. In the display of “Fountain” memorabilia, is an actual Trenton-made Fountain – a water fountain.